Shout Out to this young brotha who is a true inspiration to the Youth Stars Kevin Stonewall! 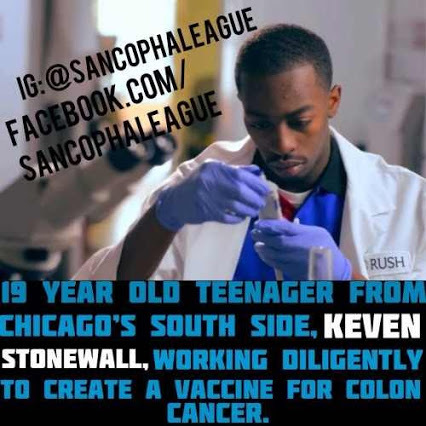 At just 19 years old Kevin Stonewall who is from the South Side of Chicago, may one day hold the key to curing colon cancer. It was in his senior year of high school, that he has started working on a potential colon cancer vaccine at a Rush University lab. Kevin has even inspired some of his friends since creating in the lab! For his experiment, Stonewall injected a special high concentration of cancer-treating drug mitoxantrone into younger and older mice. He then injected the mice with aggressive colon cancer cells. After three days,* Stonewall noticed that his experimental vaccine was 100% effective on young mice — their tumors were gone and they showed immunity to colon cancer. But the older mice were still afflicted by the cancer cells. King Kevin has won numerous awards for his research. He was a finalist for the Intel International Science and Engineer Fair in 2013. Stay Inspired & LIVE YOUR DREAMS YOUTH STARS!!! Posted in Saving The Youth Stars™Tagged Abundance, africa, African, Afrikan, Ancient, brotha's, Chicago, Colon Cancer, dreams, Education, fun, goals, growth, happiness, happy, Help, inspirational, inspire, joy, Kevin StoneWall, knowledge, learn, learning, Life, love, Motivate, motivation, motivational, Peace, positive, Prosperity, Proverb, spirit, spiritual, success, teach, teen, teens, wealth, wisdom, wise, words, youthBookmark the permalink.